New Study: Cats are Perfect! Cat fanciers know the drill: Cats are perfect. They pose with precision as if arranged by a stylist, they clean themselves with languid but exact precision, and they scheme smart, sly scenarios with perfect nonchalance. They are also the poster pet for grace and elegance. They seem to defy gravity, as well as reason, with their exquisite balance–they are phenoms in the physics department. This we know. But until recently it wasn’t known that this perfection is evident all the way down to the way in which they lap liquids. Researchers at MIT, Virginia Tech and Princeton University analyzed the way domestic and big cats drink and found that felines of all sizes take advantage of a perfect balance between two physical forces. The results were recently published in the online issue of the journal Science. It had been known that when cats drink, they stick their tongues straight down toward the liquid with the tip of the tongue curled backwards to form a scoop, so that the top part of the tongue touches the liquid first. The new research reveals that the top surface of the cat’s tongue is the only surface to touch the liquid. Cats, unlike dogs, aren’t using their tongues like spoons after all. Instead, the cat’s lapping mechanism is much more subtle and elegant. (But don’t tell that to the cats.) The researchers observed that the smooth tip of the tongue barely brushes the surface of the liquid before the cat rapidly draws its tongue back up. As it does so, a column of milk forms between the moving tongue and the liquid’s surface. The cat then closes its mouth, pinching off the top of the column for a nice drink, while keeping its chin dry. Of course, none of that unsightly milk on the chin. And here’s where the cat’s innate sense of physics comes into play. The liquid column is created by a subtle and perfect balance between gravity, which pulls the liquid back to the bowl, and inertia, which in physics means the tendency of the liquid to continue moving in a direction unless another force interferes. The cat instinctively knows just how quickly to lap in order to balance these two forces, and just when to close its mouth. If it waits another fraction of a second, the force of gravity will overtake inertia, causing the column to break, the liquid to fall back into the bowl, and the cat’s tongue to come up empty. 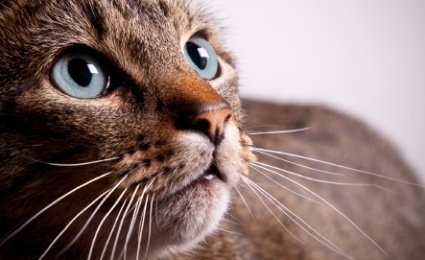 Knowing the size and speed of the tongue of various cats they studied, the researchers then developed a mathematical model involving the Froude number, a dimensionless number that characterizes the ratio between gravity and inertia. For cats of all sizes, that number is almost exactly one, indicating a perfect balance! So the next time your puss is looking smug on the couch, just remember, she is a pretty perfectly purring machine after all. 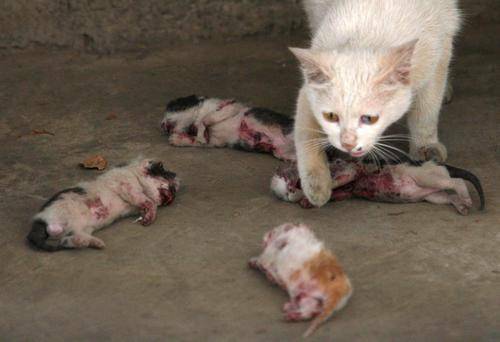 On the 11th within a Kunming Panlong District neighborhood, the four kittens of an adopted stray cat were abused to death. 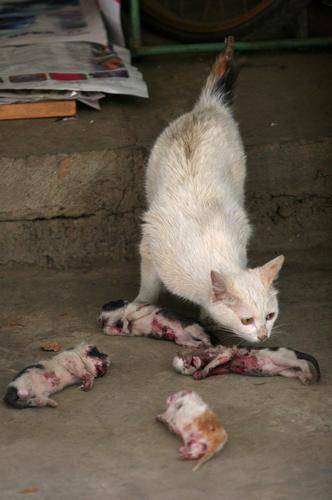 According to the family that adopted the stray cat, on the morning of the 11th when they heard the cat’s tragic cries, they rushed downstairs to discover this stray cat’s four kittens abused to death, and even placed in front of the mother cat. The kittens’ bodies were covered with bullet holes, with blood all over. One of the kittens had its neck tied with a rope and elongated, its chest cut open, heart exposed, while the other three kittens’ heads were stepped on. According to this journalist’s observation, the bullet holes on the kitten’s bodies were caused by a metal toy gun. 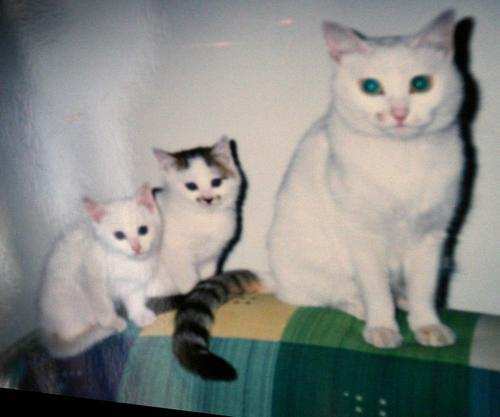 It is reckoned that during the night of the 10th, someone used a toy gun to beat the kitten black and blue, so that it was unable to escape, before continuing to abuse/mutilate it to death, and intentionally put them beside the mother cat. 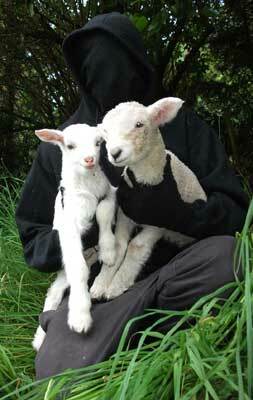 The KDS post did not include the year and month: 2006 April. 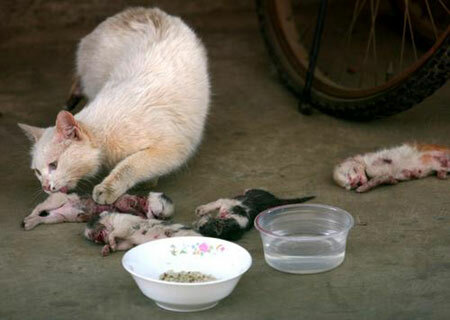 The poor mother cat kept licking the kittens, hoping it would revive the kittens. 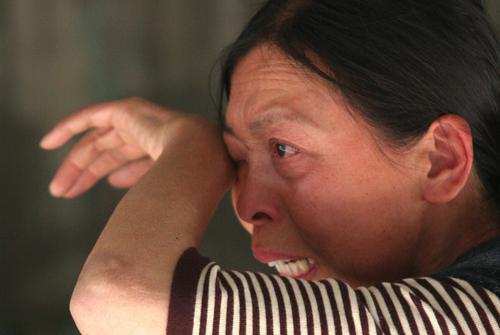 Crying, the women who adopted the cat were unable to speak, hoping that the cat abuser can be found. I think is so easy to judge them,and is so difficult to do it!this women have an exteme compassion for the cats. Red flag! For most people, the combo invites the label Cat Lady, says Christie Callan-Jones, a filmmaker. 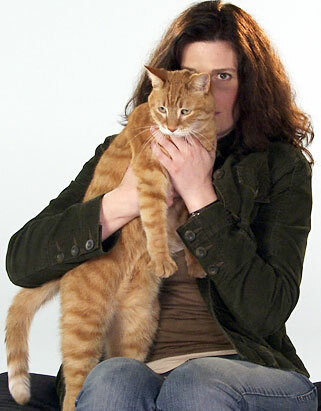 Callan-Jones’ latest documentary, “Cat Ladies,” tells the stories of four women and their devotion to their cats. Elizabeth Vargas of ABC’s “20/20” recently sat down with Callan-Jones to examine the unique relationship some women have with their feline companions. For some of the women, pet ownership has turned into an obsession with cats, or an addiction to helping cats. 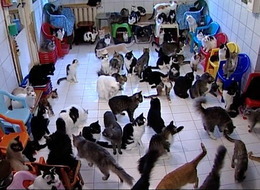 But what made the women “cat ladies,” Vargas found, was more than the number of cats the woman owned, be it three or 123. More influential was the emotional attachment between pet and owner. The film began as an idea of Suzanne Mullett of Chocolate Box Entertainment. Jeannette Loakman and Sally Blake of Chocolate Box produced the film.